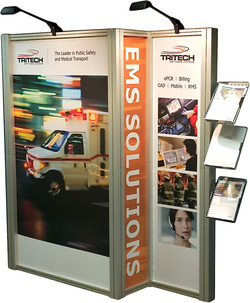 There are hundreds of models of portable / modular displays in the world and believe me, we've seen them all. Some are really cool, some... not so much. But if 20+ years in the business have taught us anything, it's that the hardware kit doesn't matter one bit if the graphics aren't designed properly! 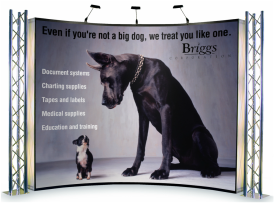 We've helped so many companies be effective at shows, we've lost count. 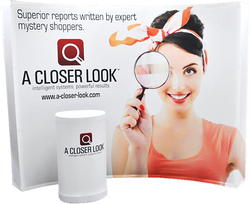 Let us design you an exhibit that will stop prospects cold. 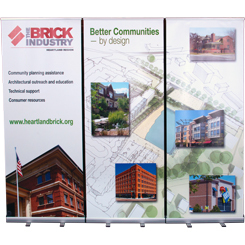 A popup frame with a vivid, dye-sublimation fabric graphic that stays loaded for easy setup. A beautiful display that sets up in SECONDS! Available in 8 or 10 foot curved OR 8 and 10 foot straight units. The company that INVENTED the popup display and still the industry benchmark. The Instand comes with a lifetime, no-questions-asked warranty and accepts the highest image quality Lambda graphic panels. Available in 8 or 10 foot curved OR 8 and 10 foot straight units. The contemporary look and portable versatility of the Wavetop Series is second to none! 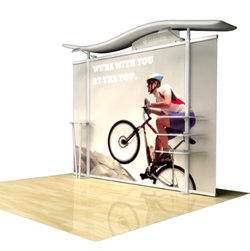 Available in various configurations, the Wavetop makes the perfect back wall display. Set up of the Timberline utilizes a user-friendly modular design ensuring easy assembly. Our Wave Tube displays are popular due to the ease of transport, ease of set up, and economic price. The frame and dye-sublimation graphic together are extremely lightweight, easy to ship, and come packed in a sturdy nylon suitcase with wheels for easy transport. 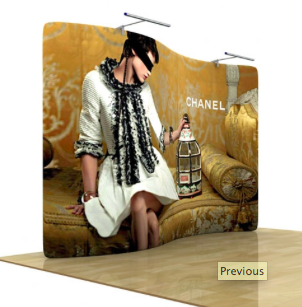 Your display will set up in just minutes, and look fantastic. These are available in 8 foot, 10 foot, wave, curved, serpentine (pictured) and straight models. When no existing portable modular display will quite meet the challenge, let Brainstorm design and build you a display to precisely match your requirements. You'll be surprised at the reasonable cost, and high quality result!